Visit one of Spain’s largest Canary Islands, Tenerife, and become familiar with its gastronomy on this 8-hour tour. In the UNESCO-listed town of San Cristóbal de La Laguna, spend time sampling local wine and cheese at two popular wineries before relaxing over a 4-course meal with wine. Then, pop over to the fishing village of Candelaria to learn about its religious background, and check off its must-see sights. Get picked up in an air-conditioned coach by your tour guide at your Tenerife hotel. Please check with your service provider ahead of time to make sure your hotel is one that they pick up from. Your 8-hour tour will depart about 9am. Start your food tasting adventure in San Cristóbal de La Laguna. Stop by two different wineries, and sample some of the area’s most popular wine and cheese choices. After you’ve gotten to try some of the food and wine the area is famous for, as well as loading up on plenty of information from your guide, it’s time to indulge in a 4-course meal to keep you satisfied for the rest of the day. Enjoy your lunch in a relaxed setting while sipping some wine and taking in the beautiful ocean views. Candelaria, is next up on your agenda. The town is noted by Catholics in Spain and Latin America as a place of veneration of the Virgin of Candelaria, the patron of the Canary Islands. Explore the religious area, and see Basilica of Our Lady of Candelaria along your way. Then, take a ride back to your hotel where your tour concludes. This tour isn't really a gastronomy tour. Yes, we toured a vineyard and ate Canarian food for lunch, but the rest of the time it is mostly a historical walking tour of San Cristobal La Laguna. My wife and I had more of a foodie experience independently exploring the local market in San Cristobal and learning more about local delicacies from the different vendors. Whereas our tour guide viewed the market as just a place to have a bathroom break. In Candelaria, we were given a half our to basically wander the town which we could have done on our own without the tour. Long story short, food is secondary to looking at buildings and walking around towns. Plus, our tour guide Toni spoke too quickly which made anything he said incomprehensible. Lastly, our van driver insisted on not turning on the air conditioning even though it was a very hot day. I had to use some persuasive language in Spanish to finally make him turn on the air conditioning, but he was also reckless and endangered our lives with his driving. Look elsewhere if you want to actually learn more about Canarian cuisine. This was a highlight of our trip! Another great adventure!!! Do yourself a favor and book this outing. Good trip. 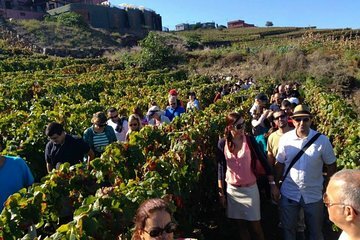 We got picked up from hotel and head to La Laguna, the guide has got good knowledge about the area, then we head north into winery , then we head to another winery for lunch and the lunch with wine was good. Would recommend this for wine lover.